Wiseass and life coach Anthony Bourdain is giving you yet another reason to worship him. In this video, produced by the team behind The Taste and obtained by Eater, Bourdain goes on a breathless rant about In-N-Out's greatness. He says it's not just the "only fast-food chain that [he] actually like[s]," but his favorite restaurant in LA. The man goes for Animal Style obviously, and hilariously claims that Instagramming an In-N-Out burger would get more social media traction than a photo of him, Christopher Walken, the Dalai Lama, and Keith Richards in a hot tub doing bong rips. If that image appeals to you, head over to Eater for the full pitch. Kristin Hunt is a Food/Drink staff writer for Thrillist. 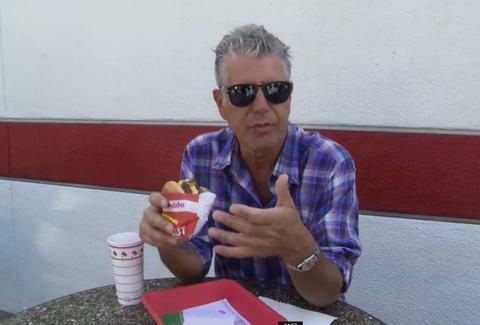 She's sure In-N-Out is delicious, but don't act like you don't love Shake Shack, too, Bourdain. Follow her at @kristin_hunt.